"This delicate dish loaded with ham, cheese and bread cubes in an egg mixture is perfect for brunch or supper. 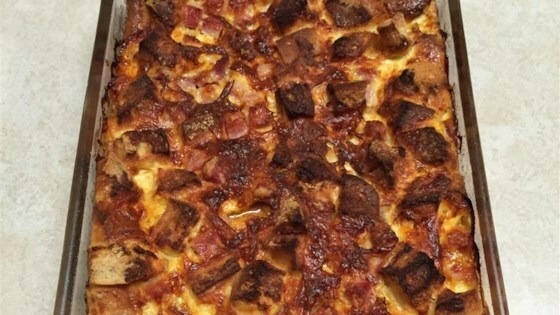 Light and fluffy casserole that is sure to please your guests. Goes great with some fresh fruit and blueberry muffins! Another plus is you make it day ahead, so you have more time out of the kitchen!" Generously grease a 9x13-inch glass baking dish with softened butter. Stir together flour and mustard powder. Place ham and Cheddar cubes in a large mixing bowl, sprinkle with flour mixture, and toss until evenly coated. Add bread cubes and toss to mix. In a separate bowl, whisk together eggs, milk, and hot pepper sauce. Pour 1/3 of the bread mixture into the prepared baking dish and smooth out to form a layer. Drizzle with 1 tablespoon of butter, and sprinkle with 1/3 of the Parmesan cheese. Repeat twice more to form three layers. Pour egg mixture overtop, cover with plastic wrap, and refrigerate 8 hours to overnight. The next morning, remove casserole from refrigerator, remove plastic wrap, and allow to stand at room temperature for 30 minutes. Preheat oven to 350 degrees F (175 degrees C). Bake uncovered in preheated oven until the eggs have set, and the top is golden brown and crispy, about 1 hour. Baked breakfast casserole with English muffins and Canadian bacon. Wow, I cut come corners (did not do layers, added parm to top of casserole) and I am very impressed! I added cayenne to the flour mixture. Really fluffy and delicious. I made this for Easter Brunch. Making this ahead of time makes it easy to spend time with the family and not in the kitchen. Even the "picky" eaters loved this. This was excellent. I did make a few changes-added more eggs, and less milk. I combined 9 eggs, and 2 cups of milk. It served 6 adults. Made Hash Browns for a side. I make this everytime company comes! It is also good with bacon or sausage! Thanks.